It’s Canada Day tomorrow, and there is no way anyone should miss the 151st year’s grand fireworks display! From Queen Elizabeth and her husband Prince Philip, to newlyweds Prince William and Kate Middleton, all have attended previous anniversary events for the exciting Canadian holiday. Spanning across the country, there are many hot spots for fireworks that are popular this year, some of which are mentioned below! Canada Day is a national holiday, celebrated as the anniversary of the unification of Nova Scotia, Canada, and New Brunswick into a single Dominion of the British Empire, back in 1867. The celebration of the day comes with festivities like parades, concerts, and of course, fireworks at night! If you’re frantically searching for a “fireworks show near me” before tonight’s big celebration, we’ve found a few great spots to check them out in specific areas. Resonating from fireworks shows in 2017, the 1st of July shows this year are going to be even more fantastic! From Montreal and Toronto to Edmonton and Vancouver, there are some spectacular places to enjoy some of the best firework shows on Canada Day 2018. Offering enthusiasts a wide range of activities near the falls, there is plenty of live entertainment and activities you can do near the mesmerizing Niagara Falls. Aside from the amazing Canada Day parades and concerts, and at the end of the day, there will be a spectacularly illuminated sky! The Niagara Parks have been pleasing people with a huge fireworks show on Canada’s birthday for over two decades now! They have year-long fireworks shows, at 10:00 p.m. every night in the summer, and while you are there you can also see the illumination of the grand falls itself. You can visit the Niagara Falls tourism website for more details. Toronto is one of the most popular spots for Canada Day celebrations, and their fireworks display on the water is absolutely brilliant! There are also quite a few large parks in and around the downtown core that put on fantastic shows for the public! Such parks include: Centennial Park, Milliken Park, Weston Lions Park, and Amsbury Park among many have the show scheduled at 10:00 p.m.
And places like Mel Lastman Square have also scheduled a show at 10:30 p.m. to celebrate Canada’s birthday! Old Port is the place to be in Montreal for Canada Day! Not only is the admission free, but you can also enjoy a variety of activities at the Jacques-Cartier Pier. Bring your entire family for a full day’s worth of events including musical performances, the 21-Gun Salute, workshops, and more. 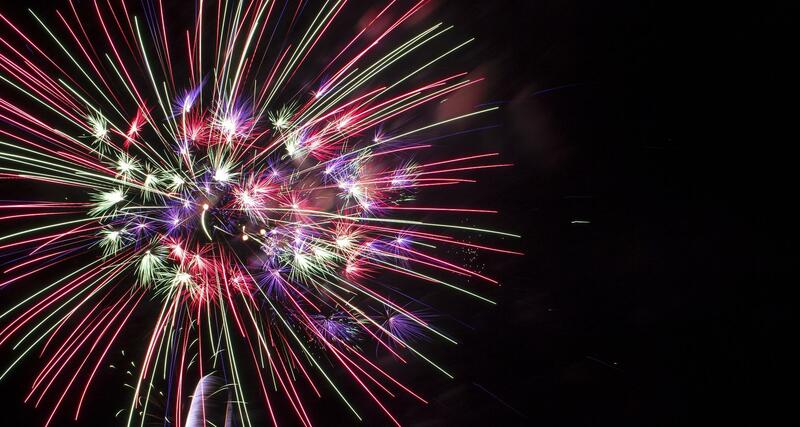 End your day with a glittering finale in the sky at 10:00 p.m.
Fireworks shows in the capital are bound to be one of the best in the country, and The President’s Choice Canada Day fireworks show is the one you need to see if you’re in or around Ottawa this year! The pyro-musical event starts at 10:00 p.m. and is touted as one of the best fireworks shows in the country. The best places to view the show are: behind the Canadian Museum of History on Laurier Street, Gatineau, and Major Hills Park, behind the Fairmont Chateau Laurier. You can also view from multiple spots around Confederation Boulevard, and Gatineau. Victoria Park in Charlottetown, is the hot spot in PEI for all Canada Day activities! Kick off the day with a triathlon for kids starting at 9:00 a.m. for children aging between 5 to 13. A 21-Gun Salute follows at noon, and you can spend the rest of the day doing activities around the park. Then, gather around at 10:00 p.m. for a spectacular show launched from the boardwalk, which lines the entire park. There are several places where you can view the grandeur of illuminated skies in Vancouver for Canada Day. Head over to Coal Harbor for a great view of the waters and the skies, or visit Canada Place and grab a comfy corner. From the Convention Center to the Vancouver-facing side of the Stanley Park, you can find multiple spaces for you and the family to enjoy Vancouver’s beautiful fireworks show. The fireworks show start at 10:30 p.m. in the Burrard Inlet off Canada Place, but you can view the show from a number of other locations, too. Avoid Spanish Banks, Kitsilano and English Bay, and opt for Crab Park or Harbor Green Park instead! This one is apparently the best to be sure you’re set for a great Canada Day! If you’re just across the water on the island, Victoria also puts on a magnificent fireworks display and Canada Day event at Victoria’s Inner Harbour. There are Canada Day events going on all day downtown, beginning around noon. Grab a seat on the lawn near The Embassy and watch the sky light up over the water; it’s breathtaking and it all goes down at 10:20 p.m.! Or, head over to the Legislature Lawns in Victoria for a sun-filled Canada Day! The fun begins at 12:00 p.m. and ends with a fireworks show scheduled at 10:20 p.m.
Be there to sing the national anthem at 3:30 p.m. The kids are going to be occupied in the kids zone from noon to 5:00 p.m. as you enjoy other activities like participating for the largest “Living Flag” and enjoying all that the “food village” has to offer! Edmonton has been one of the sweet spots for Canada Day celebrations for a while now, and there is no better place to be at 11:00 p.m. on July 1st! Near the North Saskatchewan River, you can choose from spots like Ezio Faraone Park, Government House Park, Alberta Legislature Grounds, and Victoria Park among many others. A word of advice; Avoid Kinsmen Park, and also taking the watercraft! If you have tickets to the Edmonton Prospects vs. Brooks Bombers Baseball game on July 1st, you’re already welcome to enjoy the view from the RE/MAX Field right from your seat! Dundonald Park at 10:00 p.m.
Diefenbaker Park at 10:40 p.m.
Lion’s Park at 10: 30 p.m.
Radission Ball Park at 11:00 p.m.
We hope this list has made your Canada Day planning easier! Have a safe and happy Canada Day!